A battle of words between Kazakhstan and Kyrgyzstan is now seemingly taking a more serious turn as a major border crossing between the two nations grinds to a near-standstill. It does not look like many are buying that story in Kyrgyzstan, hundreds of whose citizens have been made to wait for hours since the evening of October 10 at the Kordai crossing, which is situated just outside the capital, Bishkek. This unseemly squabble has its origins in a remarkable rant from Kyrgyz President Almazbek Atambayev on October 7, when he lashed out in a rage over Kazakhstan’s perceived backing for one of the presidential candidates in an upcoming election. “I understand why the Kazakh authorities want to force their candidate on us. They love [former president Kurmanbek] Bakiyev. To this day, the Bakiyev family goes for its holidays in Kazakhstan,” Atambayev said at an official state award-giving ceremony. Since dozens of people were killed by government forces in the April 2010 revolt that toppled Bakiyev, who now lives in Belarus, the charge was incendiary in the extreme. Atambayev went further, accusing Kazakhstan’s officials of cheating their pensioners of their just income. “It is obvious that with only one week to go before the presidential election, which are on October 15, the leadership of our neighbor nation is suffering from shredded nerves,” said Sanat Kushkumbayev, director of the Kazakhstan Institute of Strategic Studies. The Foreign Ministry in Astana was, naturally, unable to simply dismiss the Kyrgyz president out of hand and fired off an official note of passive-aggressive protest. “We are confident that the irresponsible, and fundamentally provocative and mendacious pre-electoral assertions made by the president of Kyrgyzstan cannot harm the centuries-old legacy of friendship and mutual assistance between our nations,” the note read. And then on October 9, Atambayev’s office announced out of the blue that he was cancelling his attendance at an upcoming Common of Independent States heads of state summit in the Russian city of Sochi — an event that would have required the Kyrgyz leader to meet in person with his Kazakhstani counterpart, Nursultan Nazarbayev. Atambayev’s office provided an exotic excuse, however. “Consider the detection of evidence of preparations for unrest on election day on the part of certain politicians … the president has decided to cancel his working visit, so that he can personally monitor that there is order and security in the country,” Atambayev’s office said in a statement. Russian analysts queried by Sputnik news agency called nonsense on that, suggesting instead that the snub stemmed from Nazarbayev’s contentious decision to meet last month with Omurbek Babanov, the multimillionare standing in the presidential election against Atambayev’s own man, Sooronbai Jeenbekov. “Babanov isn’t an extremist or a terrorist, he doesn’t threaten Kyrgyz statehood. Of course Kazakhstan is not backing the president’s candidate, and that is really aggravating the Kyrgyz leader — but that’s democracy for you. The fact he cancelled his visit to Sochi shows Atambayev is nursing sore feelings over Nazarbayev,” international affairs analyst Andrei Kazantsev told Sputnik. 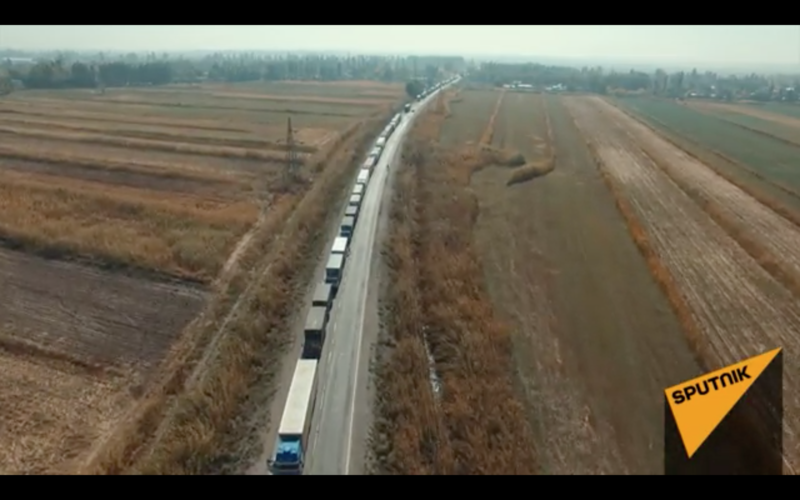 And this brings us up to October 11 with long lines of cars and people forming on either side of the Kazakh-Kyrgyz border. Kazakhstan border officials imposed a high-security regime at 6 pm on October 10, massively slowing down the passage of travelers. The Kyrgyz border service then replied with its own high-security regime two hours later. And just to ratchet up the already-strained nerves, Kazakhstan’s military has dispatched several truckloads of troops to the border and erected checkpoints. The troops are reportedly set to remain there until after Kyrgyzstan’s elections are over.